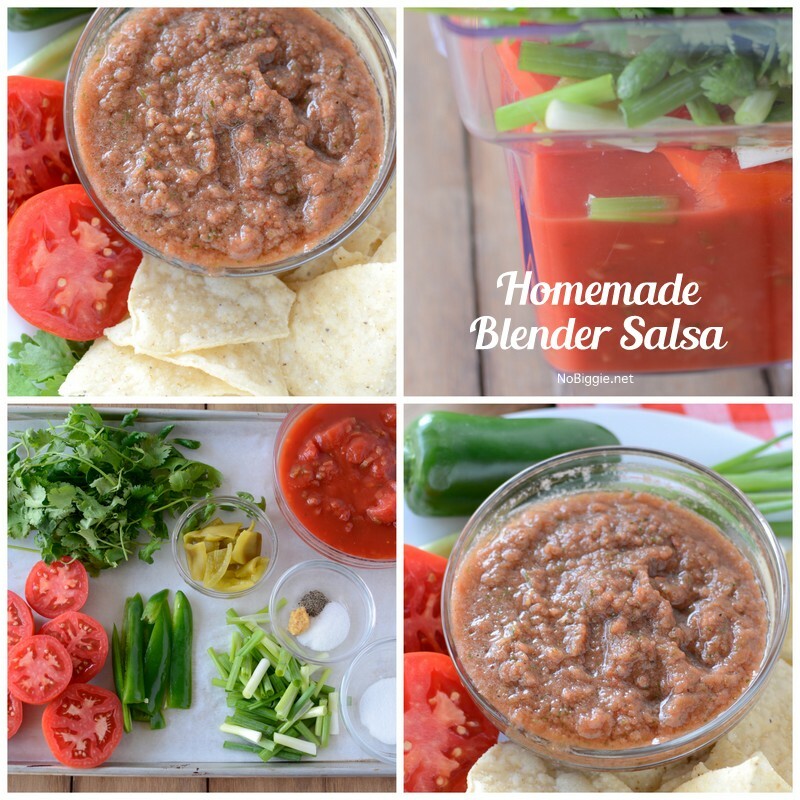 Homemade Blender Salsa is so fresh and could not be MORE easy! Watch the How To Video below. It’s absurd the amount of chips and salsa consumed in our household. 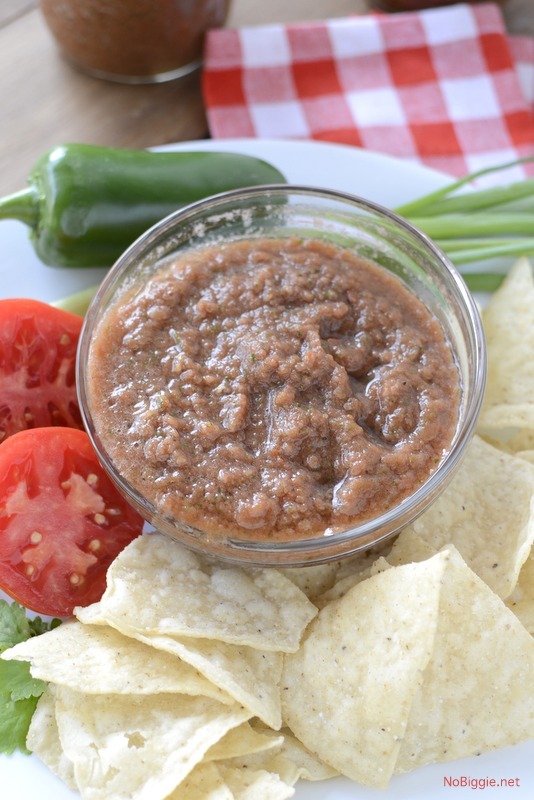 My Aunt shared this recipe with us, and it’s now our favorite salsa recipe. The best part is that you can make it year round since you can use canned tomatoes. When tomatoes are in season, they make this recipe even that much better. So pick up your favorite bag of chips, all the ingredients, and let’s get blending! Here’s the ingredient line up. If tomatoes are in season, be sure to use them up in this recipe. If not…no worries, this recipe is still so good without fresh tomatoes. 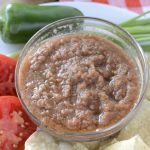 The great thing about this recipe… is that you can control the texture whether you like salsa on the chunky side or a little more smooth. As you can see in the picture, we like ours on the smoother side. Do you have a good blender? We’re crazy about our Blendtec Blender. It makes this recipe a breeze. Add all ingredients into a blender and blend to your preference. Serve with your favorite chips and enjoy! 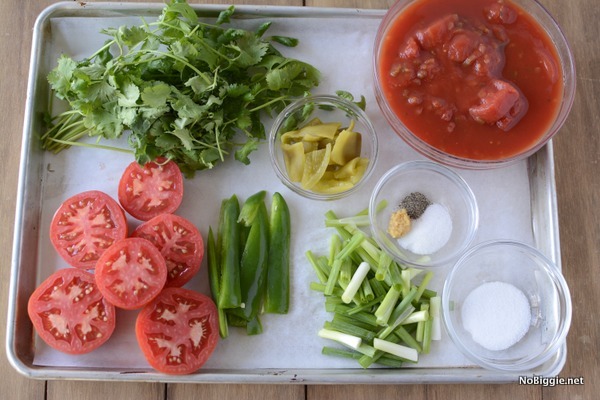 For a thicker salsa remove 1/2 cup of the juice from the canned tomatoes before combining all the ingredients. Diced fresh tomatoes will work in this recipe too. We made a quick video to show you how easy it is to whip up! If you like your salsa more on the hot side, you can leave the seeds in the jalapeños. Or you can add in a little hot sauce. Hope this recipe becomes your family’s new favorite!